I have a free review copy of Xenoblade Chronicles X from Nintendo. All opinions in this article are my own and information is accurate to the best of my ability and knowledge. This is going to be somewhat unorganized, but I'll keep this page updated with pre-release information that people seem to want to know including impressions, screenshots, and videos. Let's get to it! The world is massive and beautiful. You'll be spending a lot of time doing minor side missions, less minor affinity missions, and not at all minor story missions. These typically involve collecting items, exploring new areas, and fighting enemies. Collected items can also be used to craft new equipment and augments and upgrades for your equipment. Exploring will open up "landmarks" to fast travel to and in some places you can plant data probes which give various benefits such as mining valuable materials for quests or for investing in equipment manufacturers. Enemies vary in hostility just as they did in Xenoblade Chronicles and there are also certain stronger versions of normal enemies that are often tied to quests. There's an enemy log and collectopedia for keeping track of enemies and their drops, and all of the random items you find scattered across the world. Completing affinity missions improves relationships between characters, unlocks new party members who can join you upon request, and may unlock new Arts as well. While I haven't discovered difficulty options overall, I did find that I was offered to lower the difficulty for a single boss after dying to it a few times in a row. Arts work similarly to how they did in Xenoblade Chronicles. They require a cooldown in most cases and often work better in a certain order (Topple enemy -> Move strong vs toppled enemies). Positioning relative to the enemy is also important. Depending on your class, you'll get different Arts and use different weapons. You'll also unlock skills which can be equipped and leveled up for passive bonuses. There's an overwhelming amount of information and menus to keep track of in this game. That's good for complexity, but I honestly still feel like I'm missing out on certain things (multiplayer especially). The game does a good job of explaining everything a little at a time, but it still feels like a lot at once - but I prefer it that way over holding back too much of the game for too long. It is possible to replay certain boss battles in a time attack challenge for rewards and for glory (the fastest time of the day is recorded on the server). Minor peeve: Sometimes when fighting large enemies for a quest, a larger, ridiculously strong enemy will wander in and you won't even see it until it kills your entire party in one hit. Actually, on second thought, this is often probably my fault for using AOE attacks and hitting other creatures without accidentally. Random note: For the most part, everything you need to know is explained in-game, but there's a whole lot of things that aren't well explained in-game. Thankfully, the digital manual is quite in depth and covers seemingly everything you'll want to know. You don't get your first Skell until after Chapter 6 (fairly far into the game) and there's a long-ish quest required to get it, but it's definitely worth the trouble. It looks cool, goes fast, jumps high, and hits much harder than you would on your own. Skells have a whole bunch of equipment slots and each equipped item gives you an Art associated with it, so there are a whole lot of variations available. 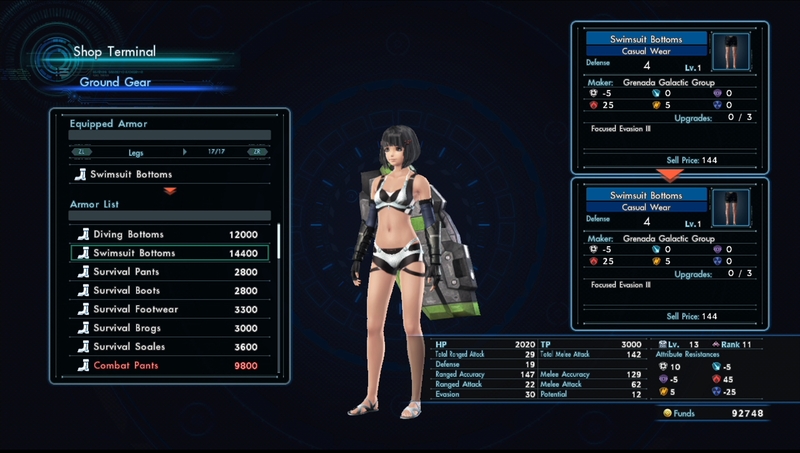 You can also name your Skell and customize its colors with nice Photoshop-esque color sliders. There are better and better Skells that you can get as the game goes on as well. There seems to be less focus on the main story compared to Xenoblade Chronicles since you're required to do certain affinity missions and other arbitrary goals before moving on to the next story mission. That said, the story is still really epic so far although I have a long way to go. By the way, the voice acting and writing is fantastic and often funny, especially when it comes to the other alien races. The characters' visual design however, at least for the humans, is kinda bad in my opinion. At the beginning of the game you can customize your character. There's a lot more depth to it than most games, but not as much depth as other games. Watch the video to see for yourself. Also, there are certain hair styles that are unique to a particular "base face". Rumor buster: "The bust slider is removed in non-Japanese versions of the game, even for 'woman' character models." CONFIRMED. If activated, other players' achievements will pop up in the top left corner when they're unlocked. It seems that achievements you've seen from other players will be visible in your own achievements list so that you can get hints of what you have to do to achieve them. For achievements that you have gotten, you can see the date on which you got them, which is pretty cool. When you start the game, you can choose between focusing on the main story, focusing on multiplayer, or focusing on doing stuff with friends. At this point, though, it's not very clear how this makes a difference since I have no friends to play with and I've yet to see how to even join a multiplayer session. It seems that multiplayer missions have to be unlocked. However, it is possible to see other player characters out in the field and they have customized greetings (you can type in whatever). These characters can be recruited to your party for a thirty minutes and behave as computer-controlled characters. Since the other player characters do have foreign language greetings,, but not in Japanese, and since the English version of XCX seems to use a separate Miiverse community, I'm led to believe that multiplayer is region locked, at least in regards to Japan playing with anyone else. Can you play on the GamePad only? - Yes, but the menu and HUD font is super tiny. I wouldn't advise it. On the other hand, once you are familiar with the menus, you won't have to read the text as much anyway. Does the game audio play on the GamePad when playing on the TV? - No, the GamePad only plays the "beep boops" of using FrontierNav on the GamePad, but if you switch the screen to have the gameplay on the GamePad, it will play all of the game audio. Can we take a moment and appreciate how cool of a name "Full Metal Jaguar" is? - Yes, let's. Do separate NNID accounts have their own save file? - Yes. And by the way, you can only have one save per account. Can you confirm that the fashion menu is available in the regular base game and not as DLC [as it was in the Japanese release]? - Yes, it's available from the start and allows you to have the appearance of any equipment you can have, while maintaining the stat benefits of any other equipment you want to equip. The DLC characters and affinity missions from the Japanese version are available in the base game for no extra charge as well. Keep checking back to this page as the game's release approaches for more details and leave a comment with your questions. I'll do my best to answer them if possible!